Dr. Aaron Lisberg graduated from the University of Minnesota Medical School and then completed his residency program at the University of Washington. He has also done a fellowship at the UCLA Medical Center. He is specialized in Medical Oncology and board certified in Internal Medicine. 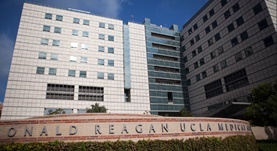 Dr. Lisberg has been in practice for more than 3 years and is affiliated with the Ronald Reagan UCLA Medical Center. During his career, he has also contributed to three 3 clinical research publications. Dr. Aaron Lisberg has contributed to 2 publications. Epigenetic regulation of the cell type-specific gene 14-3-3sigma. Oshiro, M. M., Futscher, B. W., Lisberg, A., Wozniak, R. J., Klimecki, W. T., Domann, F. E., Cress, A. E.; Neoplasia. 2005 Sep.
Pluripotency of mesenchymal stem cells derived from adult marrow. Jiang, Y., Jahagirdar, B. N., Reinhardt, R. L., Schwartz, R. E., Keene, C. D., Ortiz-Gonzalez, X. R., Reyes, M., Lenvik, T., Lund, T., Blackstad, M., Du, J., Aldrich, ...; Nature. 2002 Jul 4.